I was at Sussex University today (15 October 2016 ) at the Migration Awareness Day and about to talk about NGO's and refugees, about my experiences at War Child and about my book, 'Left Field', which deals with these issues. The phone rang. 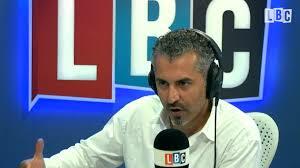 It was LBC asking me if I was prepared to be interviewed by Maajid Nawaz. I told them that I was co-founder of War Child, author of 'Left Field' and guest at this conference and could speak in those capacities. They asked me it was it true that I had been Press Officer at STW and I said I had not worked for Stop the War for years. I asked them to call back at 2.30 after my talk and assumed that the call was a result of the conference taking place at that moment. As you can tell from this excerpt the invitation had nothing to do with the migration awareness day and all to do with ensnaring me in Maajid's venomous trap. Pity they stopped this recording just before I screamed my anger at him and shut him down. For those interested in uncanny happenings. I think I have been called twice in the years since I left STW. And this call, five minutes before my talk, seemed to me obviously connected to my talk. Obviously not. Watch the interview here.